Running the ball down the field for the winning touchdown, the player bursts out of the exploding football on this unique resin action award. This 5 ¼” award is one any football star would be thrilled to receive. 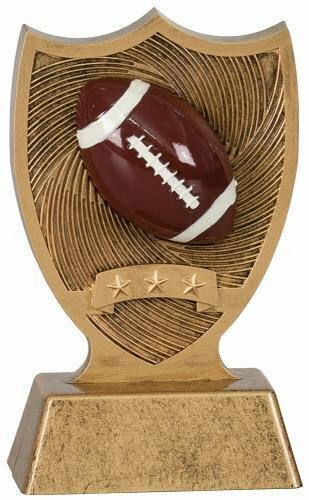 This free standing award with a full color football front and center is made of molded plastic that is weighted to add substance. Simply add a plate to personalize this budget friendly award for your event. A beautiful smooth crystal football that spins freely on top of a clear crystal base. There is space on the base for engraving.